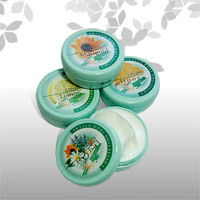 Products / Face Care / Facial creams "Collection from nature"
Universal cosmetic facial creams with natural plant extracts and oils lemon, almond, homey, marigold, cucumber and herbal complex. They are very efficient for daily skin care, they protect it against unfavorable weather conditions. Aqua, PEG-100 Stearate, Glyceryl Stearate, Cetearyl Alcohol, Paraffinum Liquidum, Isopropyl Palmitate, Isopropyl Miristate, Propylene Glycol, Glyceryn, Parfum, Dimethicone, PEG-8, Plant Extracts, Phenxyethanol, Methyl Paraben, Propylparaben, 2-Bromo-2-Nitropropane-1.3-Diol.